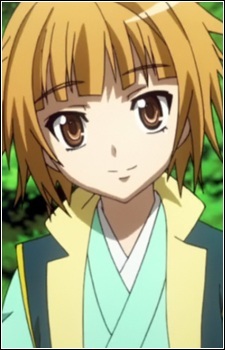 He is Nobuna's younger brother whom he doesn't get along with, he once mounted a failed rebellion against his elder sister before, but was forgiven. Until in episode 2 he mounts another rebellion only this time it failed peacefully without any bloodshed, thanks to Sagara's quick thinking. He was about to be killed by his sister until Sagara convinces her to forgive him, he therefore promises to abandon any plans for rebellion and changes his name to Tsuda Nobusumi. In ep.7 Nobuna forces him to become Oichi, dressed him up as a girl and gave him to Asai to be his bride.